On the west coast of Vancouver Island in British Columbia, Sarah, seen here, my other daughter Charlotte and I spend a last few quiet moments alone together on a rugged, windswept beach. The summer fades in the final moments of August 2008. As is common on the west coast of Vancouver Island, we’ve spent a week-long summer holiday in the pouring rain. But it was fun: sunbathing and sandcastles were replaced by surfing, kayaking and boogie-boarding. If you’ve gotta get wet, it might as well be fun, right? Not a lot of opportunity for photography either ... I had hoped to get some nice material of the kids playing on the beach, but the grey weather is not very inspiring. Then, at the last possible moment, the sun breaks through the clouds, and my chance for a few good shots is here. It’s not long before I have a good assortment of Sarah roaming the windswept rocks. Painting children interacting with the environment and the effects of environmental elements on the kids is intriguing. 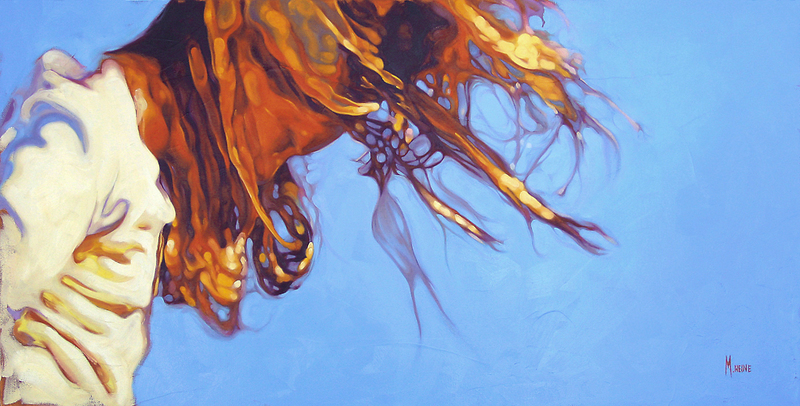 It adds an element of movement to the painting and that effect of motion is something I’ve been exploring lately. In this case, Sarah’s hair is flowing in the currents of wind – we of course can’t feel it here, but we can relive the feeling based on our experience.